Are you guys ready for this? It is going to be a bit of a rant. I don't know what a lot of the people designing clothes for toddlers lately, could possibly be thinking! So often I see clothes which are too mature, too gaudy, or down right tacky marketed to children and lapped up by the parents. 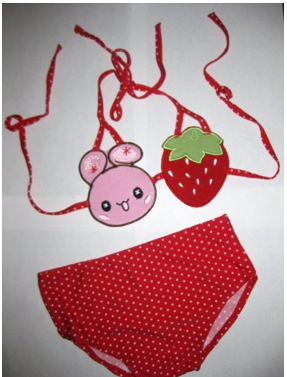 I admit that I maybe a bit more inclined to child modesty than many, but so some of the swimwear is just crazy! My pet peeve is the toddler bikini. I will be the first to admit that I find babies and toddlers to be absolutely adorable when they are in just a diaper, but that is for home and closed situations. My question is, why do we have to throw on a bikini and sexualize them. Why do toddlers need little triangles to cover their "boobies", it is just foolish. Even many of the one pieces feature cut-outs and foolishness inspired by adult style that just do not translate. We stand firmly in the rash guard camp. I am so pleased that lately many retailers seem to be of freeing a much greater selection. I love them 50% for the modesty and 50% for the sun protection. But bikinis are really just the tip of the iceberg, with summer coming all of the skimpy revealing things are going to filter down from the teen section right to the toddlers. Toddlers don't need to show skin, if anything they need the coverage from the sun! I am pleased that there are still lots of conventional kids styles available, but seeing those alternative ones on the shelf makes me pretty sick. How long before we start seeing 'juicy" written on the bottoms of toddlers, because the trend has already filtered down to the little girl section. I think it is completely inappropriate, of course children are going to want to emulate those older than them, but it is our responsibility to not allow this. Children are not aware of the ramifications of what they wear and we need to moderate their choices for them. black gross polyester in kids clothes. I can't imagine putting any of those on her separately, the combination just makes me itch. 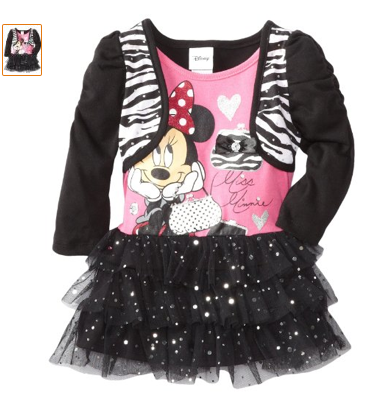 If it would be gaudy and over the top on an adult, guess what, it still is on toddlers. My daughter does't need black and bling, she is not channeling '80's Madonna, thanks. I admit I have seen a few tastefully done animal print styles (usually by Carters), but I think it is combination of all those factors together with really looks gross. Why do clothing companies feel the need to use polyester for toddler clothing at all? Is it because it is inexpensive? Because if you squint it might look like satin? There is nothing that disappoints me more than getting a nice piece of clouting home and discovering it is that cheap faux-cotton polyester blend which melts together in the dryer and just feels icky. The amount of energy toddlers burn inevitably causes them to sweat, why would we not put them in a nice breakable cotton for playtime? In fact I make a point to put her in natural fabrics as often as I possibly can. Gross polyester is not required for dressy clothes. I have found beautiful dresses in eyelet cotton or just simple crisp cotton can give a dress a beautiful vintage-y feel. I know that I may be a bit oversensitive to theses issues, but the trend is legitimately concerning to me. Some are a measure of taste, but some are a measure of decency. Remember when you dress your toddler that they only have a few years to dress as a child, and an entire lifetime ahead of them to dress like an adult. I agree with you. I've been super ticked off about toddler bikinis for years, and now that I have my own daughter - I hate them even more. So, so ridiculous. How I get my Disney movies for almost free!